If there was a common theme in the two important debates held in Memphis on Wednesday — one for three Republican county mayor candidates at the Marriott East and another for three GOP gubernatorial candidates at the Halloran Center Downtown — it was one that would surely have gratified the ghosts of Jefferson Davis and Nathan Bedford Forrest. Both sets of Republicans criticized actions by the city of Memphis that resulted in the removal of statues of the two Confederate luminaries from their pedestals last December 20th, maneuvering around an unyielding state law by selling the parks containing the statutes to an ad hoc nonprofit that went on to have them removed legally. 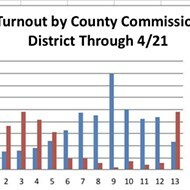 Aside from the unanimity on the point in the ranks of Republican candidates, the most interesting aspect of things was that it was the local candidates — would-be county mayors Terry Roland, David Lenoir, and Joy Touliatos — who went on to justify the harsh action of the state legislature in punishing the city by voting to strike from the state budget some $250,000 previously earmarked for Memphis’ forthcoming centennial celebration. It remains to be seen how much such a stand will cost the eventual GOP nominee in the likely general election race with Democrat Lee Harris. 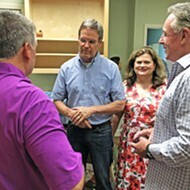 The visiting Republicans running for governor — Franklin businessman Bill Lee; Knoxville native Randy Boyd, the former state Commissioner of Economic Development Randy Boyd; and U.S. Representative Diane Black of the 6th District in Middle Tennessee — were more cautious, too much on their Ps and Qs to say anything untoward about Memphis (they were here to solicit votes, after all). But they all insisted that the statues should have been left in place and in peace — not as a matter of approbation but as “reminders” of our history. As warnings, if you will. Right. Like all those statues of Hitler that never were in post-war democratic Germany and those of Stalin that were relegated to a junk yard in Moscow’s Gorky Park after the Soviet dictator’s posthumous fall from favor. It wasn’t. There was little overt disagreement and minimal effort to create it. 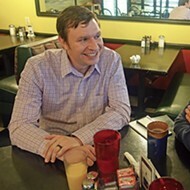 The Republican “debaters” observed uniformity not only in the politesse of not wanting to punish Memphis for its offing of statuary history, but the three of them — all Middle Tennessee residents — became an outright amen chorus to the idea that Memphis has been shafted by the state relative to other sections of Tennessee. Black went so far as to say that the city had been the victim of “Nashville neglect,” though her prescriptions for remedying the problems of West Tennessee seemed to focus on doing something about the area’s putative high crime rate. 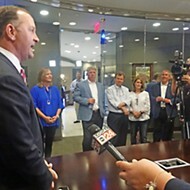 Lee called for tailoring special incentives to West Tennessee, and Boyd, as is his wont, cited statistics to justify his efforts on behalf of the area as former Tennessee Commissioner of Economic Development. 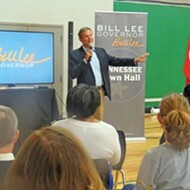 There was a good deal of Pete-and-Repeat to the candidates’ responses on most issues — on their reluctance to consider granting in-state tuition offsets to children of illegal immigrants, for example, or on means of coping with the state’s opioid-abuse epidemic, the three concurring on what Nashville TV anchor bob Mueller characterized as a “treatment-first” approach. (Businessman Lee, who has often invoked his first wife’s accidental death as the impetus for his involvement in public life referred to it in his answer to yet another focusing tragedy, a death in is family from an opioid overdose but declined to discuss any details during his later encounter with reporters in the ad hoc spin room of the Halloran Center. Some of the candidate unanimity was more apparent than real. When Mueller asked for a show of hands from those who approved arming teachers as a response to gun violence, only Lee shot his arm up right away. Both Boyd and, perhaps surprisingly, Black were more grudging with their immediate responses, each waiting several seconds before raising their hands — and slowly at that. In addition to the questions asked of all candidates, the three panelists — Mueller; Richard Ransom of the host station, Channel 24 in Memphis; and Eric Barnes of WKNO-TV, the local PBS station — attempted to nudge loose specific answers with follow-up questions and one round of questions designed for the candidates individually. Barnes prodded Boyd to explain the lagging development of the West Tennessee megasite (an area on which the former commissioner can expect more gigging from his opponents in time to come). Boyd answered essentially that other industrial sites elsewhere — the Volkswagen site in Chattanooga, for example — had experienced growing pains, too, but had turned out all right. He said that the West Tennessee megasite should be completed by the first summer of his initial term, if elected. The response of attendees at the Halloran Center was, by and large, guarded, in the same way that candidates’ answers had been, with previously known partisan of this or that candidate asserting that their favorite had triumphed but uncommitted persons remaining that way, as well. It should be noted, however, that Black’s claque in the Halloran Center auditorium made conspicuously more noise when the candidates were first introduced to the crowd. On the whole, sharper contrasts had been drawn at the earlier debate between Republican county mayor candidates — in the nature of specific answers to questions as well as in the idiosyncratic differences between the candidates. 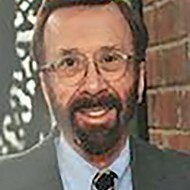 In general, Roland related most matters to his own actions and experience as an eight-year veteran of the county commission, including one term as chairman. Lenoir relied both on what he saw as his accomplishments and in specific, blueprint-like proposals for future action. Touliatos was more general and more attuned to a single theme — that of harmony between components of society and government, which she saw her personality as being well-suited to achieve. A case in point was the way in which all three principals answered a question about racial and gender disparities in county business. Roland claimed credit for the very existence of a recent county disparity study and the creation of an MBWE program (for minority and women-owned business enterprises) on his watch as chair. Lenoir said he’d “put my money where my mouth is” by investing $30 million of county funds in Tri-State Bank of Memphis, a black-owned enterprise. And Touliatos said the county should provide potential applicants with assistance on paperwork and other obstacles. On revenues and the stimulation of new economic development, Roland, as is his wont, criticized PILOT (payment-in-lieu-of-tax) arrangements and evangelized for TIFs, which adapt existing tax revenues to developmental purposes. Lenoir said there should be “real tax reduction” and attacked what he said was the “smoke and mirrors” of the 2017 budget resolution, which technically included a tax-rate reduction boasted by Roland but, Lenoir claimed, actually raised taxes on most citizens. Touliatos noted that anything the mayor did would be subject to a commission majority and said she would bend her efforts toward augmenting the relationship. 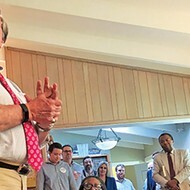 On that point, Roland said, in effect, that the cause of the ongoing power struggle between the commission and current Mayor Mark Luttrell was that the latter had never served on a legislative body and “never comes down except to fuss with us,” while Lenoir contended that he had worked on building a good relationship with the mayor and other officials. All three candidates responded to a question about protecting schools from gun violence by saying beefing up a training security force would help. (Roland noted that sheriff’s deputies already patrol the high schools.) And all three said they would prefer returning to non-partisan elections for county government and abandoning the current party-primary phase of elections. There were no great surprises in the mayoral debate until there came a question about the best means for local government to resist state encroachments on its prerogatives, like wage and drug policy, matters of discrimination, and authority over local monuments. That was when the statues matter came to the forefront. Roland said, “Until people quit thumbing their nose at Nashville, there’s nothing we can do.” He said that he and fellow Commissioner Walter Bailey had been working behind the scenes with private interests to remove the bodies of General Forrest and his wife to the general’s birthplace, but that those plans were scotched when the city “came like a thief in the night” to take the monuments down. Statements made at forums can have repercussions, too, and there’s not much doubt that brief moment of discussion about Confederate statues will be revisited, perhaps at some length, during the forthcoming general election. 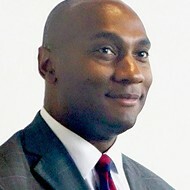 Either one of the two Democratic candidates running — Lee Harris or Sidney Chism — would doubtless make sure of that. 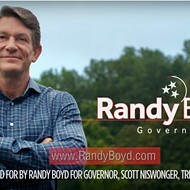 Randy Boyd: Different From His TV Ads?